Thanks, Pinterest, For My Fabulous Nail Art! I feel kind of late to the Pinterest craze, but I finally got my "approval" to join in the middle of February. Once Fashion Week craziness died down, it took me a good few hours to finally figure out that my pin wouldn't actually pin because I needed to create a board first. But once I got that out of the way, I became a little obsessed. 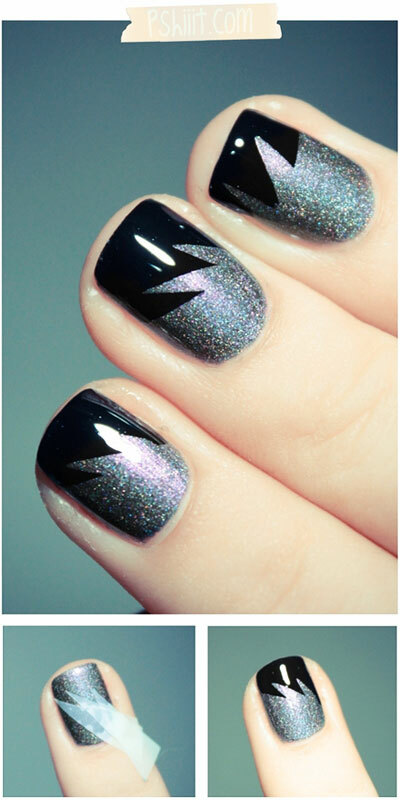 One of the more popular items that gets pinned and repinned are nail art ideas. My Nailspiration board is devoted to nail art. For the sake of my own sanity, I only pin designs I realistically feel I can recreate. Through Pinterest, I became an avid follower of the French blog pshiiit.com. She creates lovely nail designs photographed beautifully, and many times there are easy-to-follow tutorials on how to recreate the looks yourself. This striking nail art seemed easy enough to recreate at home, and I was determined to try it out as soon as I pinned it! At first I thought cutting up all the tape and applying it to my nails in just the right fashion would be a painful process, but once I figured out one nail it was quite easy and pretty quick. For my Spring-ified version, I used Butter London Tart With A Heart ($14) as a base and waited for it to dry. Next, I cut the tape into long triangle shapes like the tutorial and placed them on thumb as a test. I painted the tip with Color Club Blue-Ming ($8) and let it set for a minute or two and then gently ripped the tape off. I was so impressed with myself, that I did the rest of my nails on both hands. I cut all the tape and made the jagged shapes and then applied them to my nails and painted two coats on the tips. It was a much quicker process than I anticipated. I never really do nail art on myself, because I don't feel confident I could repeat the same thing with my non-dominant hand, but the masking technique with tape is so easy to do and so easy to repeat with your opposite hand. Thank you, Pinterest and pshiiit.com, for inspiring me with so many new nail art ideas!